In 2011, President Obama signed an executive order directing federal agencies to scrutinize their rulebooks with an eye to removing outdated regulations that were smothering the economy. "We are . . . making it our mission to root out regulations that conflict, that are not worth the cost, or that are just plain dumb," he explained at the time. The intention, said the president, was to get rid of "excessive, inconsistent, and redundant regulation" and to "reduce the burdens regulations may place on small businesses." The reinvention of Obama as the Great Deregulator was a little hard to swallow. Just a few months earlier, The New York Times had run a story ("With Obama, Regulations Are Back in Fashion") that described the "surge in rule-making" under the new Democratic administration and the complaints from industries as varied as home builders and toy makers about how "overzealous" regulators had become. Still, it was encouraging to hear a liberal president emphasize that "regulations do have costs," and stress the importance of choosing the "least burdensome" alternative when imposing mandates. Maybe the era of big regulation really was winding down? Each year the Competitive Enterprise Institute, a market-oriented think tank, compiles a report on federal regulation called "Ten Thousand Commandments." The latest iteration, just published, tallies the economic cost of compliance with regulatory decrees in America at $1.9 trillion annually. That's a sum so enormous that if "federal regulation" were a country, it would boast the ninth-largest economy on earth, ranking between India and Russia. According to the Congressional Budget Office, federal spending in fiscal 2015 totaled nearly $3.7 trillion. So the bite taken by federal regulation out of the economy last year was equal to half the level of federal spending itself  in effect, a 50 percent hike in the price we pay to be ruled by Washington. The hidden regulatory "tax" on the average US household amounts to $14,842 per year. That's more than most families spend on anything in their budget except housing. "More is 'spent' on embedded regulation," writes Wayne Crews, the author of the CEI report, "than on health care, food, transportation, entertainment, apparel, services, and savings." What Obama said five years ago is truer than ever: "Regulations do have costs." Yet far from easing its grip, Washington is gearing up to squeeze even harder. The Federal Register  the yearly compendium of proposed and finalized regulations  ran to more than 80,000 pages in 2015, the third time that has happened under the current administration. More red tape is in the pipeline: Nearly 3,300 unissued regulations are currently being finalized, and at least 218 of them will have an "economically significant" impact of $100 million or more. Yet virtually all will be imposed by federal agencies directly, with no congressional investigation or involvement, and no congressional vote. Political fights occasionally erupt over regulations that touch on sensitive religious or societal issues. An obvious, recent example is ObamaCare, with its health-insurance mandates and its compulsory "free" coverage of birth control. 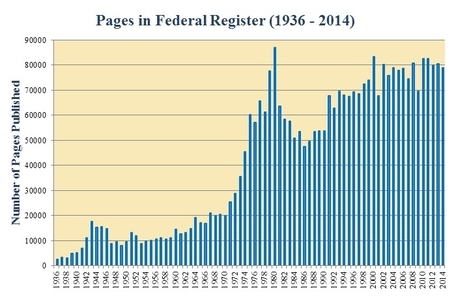 The Federal Register  the government's compendium of proposed and finalized regulations  now runs to 80,000 or more pages every year. Such a mass of red tape would have been inconceivable as recently as a generation ago. But no less important than the controversy regulations stir up is the economic anemia they induce. Not once has annual GDP growth under Obama reached 3 percent. How could it, with the economy shackled by so many new rules, restrictions, and regulations? In a recent paper, George Mason University economists calculated that if federal regulation had been locked at its 1980 level, the US economy in 2012 would have been 25 percent  $4 trillion  larger than it actually was. Twenty-five percent! Obviously, wise regulation can yield important benefits. But Washington's horde of regulators isn't exactly known for its wisdom. And $4 trillion in forgone economic growth is huge. It adds up to a lot of underemployed Americans, a lot of struggling businesses, and a lot of disaffected voters. Overregulation hurts. It penalizes employers, paralyzes innovators, and thwarts economic growth. Presidents and their promises come and go, but the regulatory behemoth grows ever more bloated.